Editor’s Note: A reader submitted a review of these on the same day Mariko wrote her review so since the reviews were wildly different, I figured we’d post both of them in one just to show that reviews are just opinions and you may not always agree with them. Ahh, the crispness in the air and the bright, clear sun can only mean one thing – summer is over! I am not a winter lover, but I do love autumn, and one of the main things I love about autumn? Yes, the ultimate Candy Addict holiday – Halloween. It’s only September, but the stores are already gearing up for the holiday of holidays by lining the shelves with Halloween candies. When I saw an ad for the limited edition Hershey’s Kisses in candy corn flavor, I pounced. Hershey’s Kisses and candy corn? What’s not to love! Well, unfortunately, there is plenty not to love. Aesthetically, these little kisses have got to be among the most attractive of Hershey’s Kisses. They look like candy corn! How clever is that? They are certainly lovely to behold, but bite into one, and you’re in for a rude awakening. Now, granted, they are flavored white chocolate, and white chocolate is often an iffy situation, but I still had high hopes. I thought they would taste somewhat like candy corn, but the main flavor that hit me was a licorice-like flavor. I’m not a fan of black licorice, so I wasn’t too pleased. After the initial shock of licorice the kiss just tasted like bland white chocolate and sweet chemicals. If I were to do a blind taste test on these, “candy corn” would never come to mind! So, these Hershey’s Limited Edition Kisses may be cute, but you’d be wise to stick with the real thing if you want to taste candy corn. 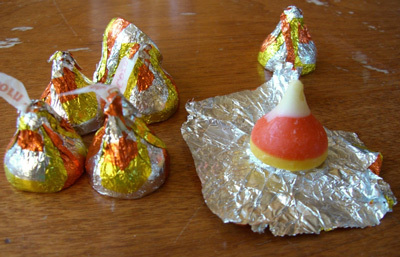 I am proud to introduce to my fellow Candy Addicts the newest member of the Hershey’s Kisses family – Candy Corn Kisses. Hershey’s really hit the mark with these! I saw them advertised in the CVS ad recently and remembering that the Neapolitan Kisses sold out right away when they first came out, I meant to go get some that day – but it didn’t happen. Then later last week, I read that they were also being sold at Target; after seeing a few bags of them on ebay for six bucks a pop plus shipping, I surmised that they might be just as elusive as their predecessors, so I set out on my mission. After checking three CVS stores and finding them all completely Candy Corn Kissless, I decided to hit our local Target. Lo and behold, they had dozens of bags of them – displayed with the Halloween candy, not among the other Kisses in Target’s regular candy aisle, FYI. When I got them in the car, I opened the bag and inhaled – mmm, they smell exactly like regular candy corn! I had imagined them as being more of a white chocolate maybe intermingled with some extra (orange and yellow) swirls of sugar. But then I unwrapped one (how cute, they even look like candy corns! …how do they get the stripes so straight?) and popped it in my mouth. Now, when I tried the Cherry Cordial Kisses and the Neapolitan Kisses, I must say I wasn’t too impressed (although with the Neapolitan ones you can improve the intended ice cream essence by refrigerating them). But these… these are trÃ©s magnifique! They are every bit as smooth and slow melting as original kisses, and they taste just like “real” candy corn only with a bit more cream, perhaps reminiscent of vanilla. Even though they are not fat-free like candy corn, they are still absolutely perfect, and tomorrow morning I’m going to be melting a few in my hot coffee. Of all of the funky-flavored kisses, these are in my opinion by far the absolute best! So what do you think, reader? Is Mariko right? Are they nasty? Or is Jenny right and they are wonderful? Leave a comment – let us know! I have tried all the limited edition flavors as well and I was dissapointed by these too. They smell funny to me. Oh well, they do look cute in a candy dish though! I think Jenny works for Hershey! I am suprised that you tasted a hint licorice, as I HATE…I mean HATE black licorice and I did not even think of that while eating them. (yes, them..lol). I tried them too. I think they taste like white chocolate, nothing else. Especially Candy Corn. They are good though, if you like white chocolate. I bought some in Target–they had lots of bags. GROSS! I thought they were GROSS! A friend of mine had 2 and I tried one and just LOVED them. Now I am on the hunt for them. You cant find them here. I think that it was a great idea, and I think that it is great. I LOVE THESE!!! they smelled sooo good! when i ate it i was in heaven!! Hmmmmmm… I have two bags of these elusive Candy Corn Kisses, one produced in September, one in October. I opened the October bag first and tasted one (then two…then three…) I didn’t get any licorice taste at all. Just lots of that “white confection” faux chocolate taste with hints of butter and vanilla. Just like candy corn. I loved ‘em! (and my disclaimer: I live in Hershey but I’m not affiliated in any way with the Hershey Company). Ew I just ate these and while not the worst things ever they taste like really low quality white chocolate. Not good at all. I searched high and low to find these things and when I finally found them at Target, I bought 2 bags. In my opinion, they smell like cotton candy and taste nothing like candy corn. None the less, I devoured both bags in one week! never tried them but look absolutely discusting to me imean choclate the flaver of candy corn YUCK!!!!!!! Does anyone know where else I can find these other than Target, who are sold out all over Raleigh, NC? 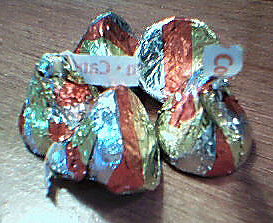 The kisses like that (the special edition ones without the traditional curl at the top) are made in a mold. I am assuming the yellow on the bottom dried, then the orange and then the white. White chocolate to me doesn’t look that solid of a white. I unfortunately missed these the Target around here I have to make plans to go and not just impulse. Some of these people are saying how nasty these things are, but when i tried these candies, i couldn’t get enough. I got 3 bags for halloween, but i almost ate the whole bowl myself. there are just so good, and i did not taste any cheap white chocolate. i guess it is just your taste buds. I work at a Kroger in Virginia. A customer came through my line with the Candy Corn Kisses, and I thought, “Wow! How cute!” Naturally curious, I bought a bag. And they did. About five or six kisses later, I was one happy candy corn lover. Someone mentioned they tasted like licorice. I do not taste that flavor. I don’t like licorice of any sort. And if these tasted like that, I would not touch them. These are buttery, creamy, melt in your mouth candy corn goodness. I’m going to stock up. That’s for sure. I really like the candy corn flavored kisses. The other ones which I like are the cherry cordial, I can’t find the dark chocolate cherry cordials any more. The candy corn flavor is a nice creation. Just so we’re clear, THESE REALLY WERE GREAT. I think these are absolutely adorable. I opened the bag in my car and it STILL smells like candy corn. I think some people are being too picky about their white chocolate. These taste AND smell amazing. Go try them and have fun! Tried a bag of these today and found them to be very ‘meh’. No licorice flavor, just an oversweetened white chocolate. Only one out of six I gave one to said they actually liked them. Two spit them out, as if it was some sort of reflex. A guy from work gave me a bag of these and I just LOVED them! They are really super sweet, but taste great! Nice white chocolate taste, I could tate just a hint of the candy corn flavor,more of a vanilla taste. Still great, for something different! I absolutely love them and cannot get enough of them. I’m addicted and am stocking up because they will be gone before you know it!!! I’m starting to believe the only place to get special edition candy is target. The orange (white chocolate) kit kats, the rocky road snickers, any of these hershey kisses… I’ve only ever seen them at target. I’m going tomorrow to pick up a bag of these… got the pumpkin spice ones last night, and they’re freakin amazing! It’s disappointing to me to see hershey with so many cool flavors of kisses, but leave their kit kat brand with very few limited varieties. Internationally, where the kit kat brand is produced by nestle, they have dozens of new flavors every year! I LOVE Candy Corn Kisses. Everyone I shared them with goes crazy over them both because of the look and the flavor. To me they have a white chocolate Easter bunny taste. I haven’t liked any of the new flavors (execpt dark chocolate), so I am no pushover. These are great! Target in New Braunfels Texas was giving sample taste of the Candy Corn. My Granddaughter and I thought it was delicious. Finally found some where I live In Uvalde Texas took them to work and my Co. Workers also liked them. Wish they were not just temporary. I love them!! I told my sis-in-law about them and she is looking in Camas, Washington. I wish I could find more. I put them on my homemade sugar cookies and gave them as gifts, and they were such a hit. Please make them again next year and I will buy more than one bag, for sure!!!!! I just spotted these at our local Wal-Mart and snatched them up. The first smell out of the bag was just like standing next to the cotton candy machine at the local fair. The design is TOO cute….perfect for those Thumbprint cookies everyone seems to make for office potlucks. The taste–nothing like candy corn….definitely not licorice….The actually have a flavor similar to the strawberry Whoppers (malted milk ball candies)…but very subtle. I love white chocolate. And that’s pretty much what they are. Delicious white chocolate that smells as sweet as a Summer memory, and melts into the taste of homemade vanilla ice cream. Yum. They can make these every color they want to, and I will buy them every time. I love candy corn. I stock up every Autumn so that I’ll have a stash for the next couple of months. I was very excited when I saw the Hershey’s candy corn in the market today. I picked up and bag. These have got to be the WORST tasting candy I have ever tried. Notice I didn’t say chocolate. There is no chocolate, white or otherwise in this creation. I guess I should have noticed when I glanced at the ingredients that it says vegetable oil with a bunch of different kinds in (). I guess the cost was just too great so my batch has 0 cocoa butter. I hate to throw away food but I won’t be finishing off this bag. Maybe it’s because candy corn is more about texture than flavor, but as this kiss melted in my mouth, the only flavor I detected was WHITE CAKE FROSTING. Just a ton of sugar and a little vanilla. I still like them, and if you just approach it as being a white chocolate kiss, it’s pretty darn good. i am proud to say I ate the candy corn kisses and fell in love. I am allergic to chocolate and am happily surprised it didn’t make me sick. It was soft and creamy like butter and slowly drips down your throat leaving a slightly sweet taste of perfection. I waited a whole year for these. I couldn’t find them until this web site. so thank you. The only other candy i enjoyed this much was the 10:30 bar that was sadly discontinued. 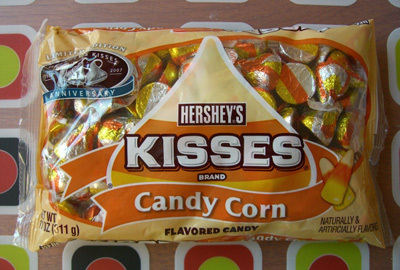 The candy corn kisses are my favorite flavor that Hershey has come out with since milk chocolate with almonds. The smell is wonderful and the taste is very creamy. They are hard to find, but I’m always looking for them. Now, M&M has a candy corn flavor and it is very similar. They are also hard to find.